Appliances alone do not create a kitchen. But, they just might be the most important aspect of your kitchen. Selecting appliances for the kitchen is a little tricky. Buy deciding on a budget, carefully measuring what space you have available and considering what colors and styles will complement your kitchen design. And also grant size, features, efficiency rate and finishes of the available kitchen appliances. 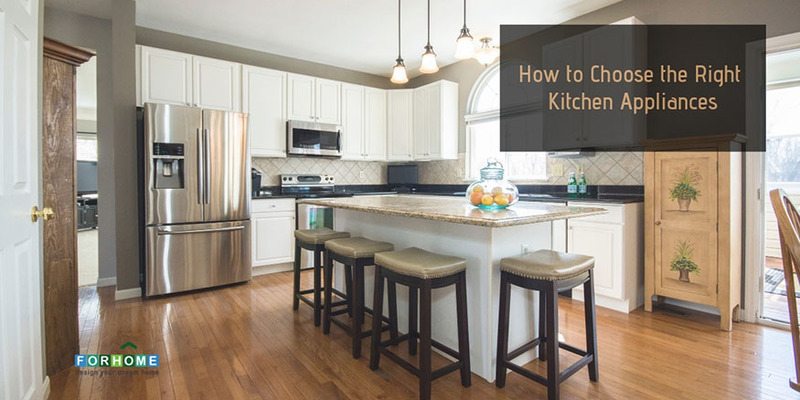 Before purchasing evaluating your needs and goals for your kitchen in several key areas will help you create a realistic appliance-purchasing strategy. Once you have established a budget and created a vision for your new kitchen, you’ll need to research specific appliances, considering the brands and differentiating factors in each category to choose the appliances with the features, performance, and style that best meet your needs. Kitchen sinks are typically made from stainless steel, enamel-coated cast iron, solid surfaces, and composites. For people who choose solid surface counters like granite or engineered stone, we recommend a stainless steel sink because of its undermount capability. Also if homeowners tend to be hard on sinks stainless is often the best choice. A high-performing convection oven, which circulates heat with a fan to cook food faster and more evenly, will help you get dinner on the table faster than a traditional oven. Bakers, on the other hand, will want the traditional bake/roast/broil. In a perfect kitchen world, you can have both with a stacked or side-by-side oven station. Now you can get drawer dishwashers, which are easier to load and can be installed at various heights based on your needs plus, they can handle smaller loads, so they are more efficient. Still, traditional dishwashers with doors that pull from the top down are the most popular style, and they can be paneled to blend with the cabinetry for a seamless look. Stainless steel still reigns in popularity. Depending on your kitchen layout, you might want to add an economy-sized dishwasher by a wet bar to manage glassware. Forhome is one of the biggest chains in Kerala hosting home fixtures and accessories from the finest brands world over. From the tiniest hinge to the most contemporary modular kitchen, Forhome has them all. With 15 directly managed stores and several franchisees across the state, Forhome has grown into the singular best stop for all kinds of home fixtures and accessories. The chain offers hardware and fixtures for every corner of your home starting from the front door to the kitchen, all the way up to the bathrooms. With a string of top brands and variants to choose from, shopping from Forhome is a pleasure. One of the most trusted providers of modular kitchens, Forhome has a full service team that specialises in installing modular kitchens for all kinds of homes. While offering only the finest variety in terms of quality and brand name, Forhome also holds an excellent repute for its customer service and after sales support. Consequently, the group has today grown into a formidable name in its segment and the best dealer for most brands of national and international repute. Copyright © 2019 FORHOME . All rights reserved.